The south split of Interstates 84 and 380. I-84 continues to Milford and Newbergh, New York; I-380 angles southeast to I-80 ahead of Stroudsburg. Photo taken by Chris Elbert (07/06). Forming part of the regional freeway network between New York City, Scranton and the I-81 corridor, Interstate 380 is a rural freeway spur in northeastern Pennsylvania. The freeway branches northwest from I-80 by Mt. Pocono to Tobyhanna, Gouldsboro, Daleville and Moscow. Combining with I-84 across Moosic Mountain, I-380 connects with I-81 and U.S. 6 at Dunmore and the northeast side of Scranton. Prior to 2001, signs Interstate 380 was signed as an east/west route to benefit travelers to or from New York City. With the route generally orientated north-south, signs were changed during the statewide Interstate exit renumbering program. Most of Interstate 380 was resurfaced between 1996 and 2001, including the replacement of original concrete. Work began on Interstate 380 in 1961 and was finished by 1976.1 The highway was initially designated Interstate 81S and then later Interstate 81E. Approved by AASHTO on June 20, 1972, I-380 was designated over former I-81E. A folded diamond interchange (Exit 1) joins Interstates 84/380 west with Tigue Street just ahead of I-81 & U.S. 6. Photo taken by Chris Elbert (07/06). Interstates 84/380 conclude at a systems interchange with Interstate 81 and the U.S. 6 freeway to Carbondale. Photo taken by Chris Elbert (07/06). Westbound U.S. 6 combines with I-81 north from the freeway to Carbondale to bypass Scranton and the borough of Dickson City. The two overlap to Clarks Summit and the exchange with I-476 (Pennsylvania Turnpike). Interstate 81 south runs along the east side of Scranton toward Avoca and Wilkes-Barre. Photo taken by Douglas Kerr (07/00). One mile ahead of Exit 187 with I-84 east & 380 south on Interstate 81 south & U.S. 6 east. Mid-1990s construction of the freeway spur to Carbondale for U.S. 6 included widening I-81 through north Scranton. Photo taken 07/04/05. Interstates 84/380 separate from I-81 south just beyond the PA 347 overpass, and well ahead of the directional T interchanges with the freeway southeast across Moosic Mountain and U.S. 6 northeast to Jessup. Photo taken 07/04/05. Exit 187 shifts motorists onto a collector distributor roadway leading southeast from the PA 347 on-ramp to I-84 east, I-380 south and U.S. 6 east. I-84 connects Scranton with Hartford, Connecticut and Boston, Massachusetts while I-380 south to I-80 east leads toward New York City. Photo taken by Chris Elbert (07/06). One mile ahead of Exit 187 for I-84 east to Milford, I-380 south to Mt. Pocono and U.S. 6 east to Carbondale. Photo taken by Chris Elbert (07/06). Traffic partitions with two lanes continuing north along I-81 and U.S. 6 to Throop and Binghamton, New York, and three lanes for U.S. 6 east and the 3.8-mile long overlap of I-84/380 southeast toward Moscow. Photo taken by Chris Elbert (07/06). U.S. 6 continues ahead onto a 15.3-mile long freeway winding northeast to Archbald, Mayfield and Carbondale while I-84 & 380 curve south toward Daleville Pocono (I-380 south) and Mt. Cobb (I-84 east). Photo taken by Chris Elbert (07/06). The first sign for Exits 1B/A to Interstate 80 references the end of I-380. This style of sign is more typically found in New Jersey. Photo taken by Chris Elbert (07/06). Local control points are used for I-80 throughout Pennsylvania. Hazelton lies near the I-80 crossroads with Interstate 81 to the west while Stroudsburg is located 13 miles to the east, just ahead of Delaware Water Gap. Photo taken by Chris Elbert (07/06). Traffic defaults onto I-80 east to Stroudsburg and New York City (Exit 1B) at the south end of Interstate 380. 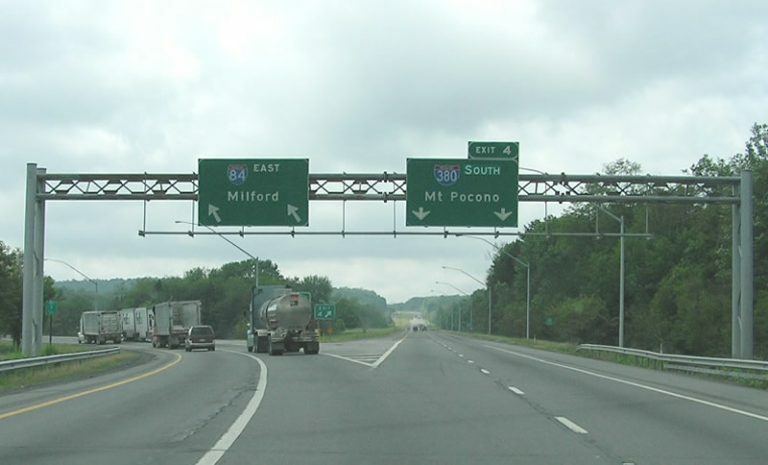 Exit 1A leads motorists west 17 miles to the Pennsylvania Turnpike Northeast Extension (I-476). Photo taken by Chris Elbert (07/06). Non reflective button copy signs for Interstate 80 along I-380 southbound were replaced by 2006. Exit tabs were previously replaced as part of the state wide exit renumbering program. Photo taken 09/01/05. Vintage button copy signs for the single lane ramps to Interstate 80 at I-380’s southern terminus. These were replaced by 2006. Photo taken 09/01/05. Traffic partitioned for I-80 west to Hazelton and I-80 east to Stroundsburg. Photo taken 09/01/05. Two miles ahead of Interstate 380 north on I-80 west. The statewide Interstate exit renumbering in 2001 included changing the cardinal directions for I-380 from east/west to north/south. Photo taken 09/01/05. Three lanes advance west along Interstate 80 to Exit 293 with I-380 north to Scranton. I-380 which was formerly known as Interstate 81S between 1958 and 1964 and as Interstate 81E between 1964 until 1973.1 Photo taken 09/01/05. Interstate 380 branches northwest toward Mount Pocono and Tobyhanna while I-80 progresses west toward Hazelton, Williamsport and Youngstown, Ohio. Prior to 2001, this exchange was unnumbered. Photo taken 09/01/05. Original guide signs for the three-wye interchange joining Interstate 80 east with I-380 north. Photo taken 07/00. Pennsylvania Highways: Pennsylvania’s Dearly Departed Interstates. Page updated October 3, 2018.